TAKING FLIGHT Liz Jahren and Nick Sholley hope to avoid avian aggression in Conor McPherson adaptation. There is little a responsible reviewer can say about Main Stage West's eerie, unnerving production of Conor McPherson's The Birds. Any description of the play's tone, pace or point of view stands the risk of tipping audiences off, reducing the pleasure of experiencing this taught, emotionally rich, exquisitely acted tale as it masterfully unfolds. Even if you've seen the classic Alfred Hitchcock film, you should not assume you know what McPherson and director Elizabeth Craven have in store for you. Less about birds than about ordinary people stripped of everyday assurances, The Birds is simple, psychological horror—the more powerful for its subdued, casually observational storytelling. Running through April 23 (and please note that the ornithological thriller plays on Easter Sunday, the day millions of sugary Peeps are ravenously consumed), Main Stage's tense, edgy drama is much closer to Daphne du Maurier's original 1952 short story than it is to the 1963 Hitchcock version. But it's not exactly du Maurier, either. Carrying spooky echoes of Night of the Living Dead and No Exit, The Birds begins with Liz Jahren's chillingly resigned voiceover, succinctly describing the rapid fall of civilization after all the birds of the world suddenly, and violently, began attacking and killing any person in sight. To the frightening sound of shrieking birds, a pair of strangers—Diane (Jahren, excellent) and Nat (Nick Sholley, the same)—take refuge in a dark, abandoned farmhouse. He's got a fever. She's got a diary. They hide. Then some stuff happens. Diane writes it all down, and we hear snippets of her end-of-the-world journal as that initial voiceover narration regularly returns. Sound designer Doug Faxon and light designer Missy Weaver do excellent work in bringing this birds-instead-of-zombies nightmare to such vivid life. Rae Quintana and Anthony Abate appear, at various points, as fellow survivors. More stuff happens, unfolding in a series of individual vignettes, each one separated by hours, days and weeks. The characters frequently discuss the importance of human kindness—a hopeful suggestion that pulses at the heart of what's to come, and is a big part of why The Birds is ultimately so haunting, rich and quietly disturbing. 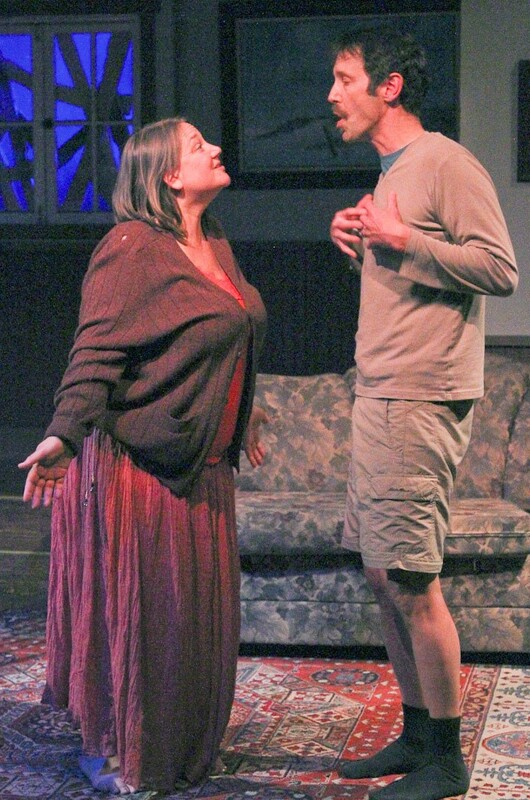 'The Birds' runs Thursday–Sunday through April 23 at Main Stage West, 104 N. Main St., Sebastopol. Thursday–Saturday, 8pm; 5pm matinees on Sunday. $15–$30. 707.823.0177.